On one of my previous post on introducing "CVNE Contino" (see my post of Sat. 03.28.09), I was talking about the fact that Graciano, which usually constitutes a minimal part of the blend with Mazuelo (also known as Carignan in France and Cariñena in Spain) in Rioja's wines, only complements Tempranillo to add color and aromas and part of the structure and texture. Graciano is a late budding grape variety, with naturally low yield, that necessitates longer ripening season than Tempranillo and is usually rarely bottled on its own. Yet, quite a few property now possesses some old vines Graciano and the wine that this grape produces is characterized by its deep red color, strong earthy aromas and ability to age well, but only few are the wineries daring to bottle Graciano. Along with Contino led by skillful winemaker Jesus Madrazo, Bodegas Viña Ijalba is one of these few adventurous estates setting the example and the trend. Viña Ijalba was founded in 1975 by Dionisio Ruiz Ijalba, with the planting of the first vineyard of Villamediana de Irega (near Logroño). Since then, the vines of Viña Ijalba have been cultivated strictly in accordance with traditional Rioja rules and, more importantly, organic methods: high density, in infertile and shallow soils, no use of chemical fertilizers (only dung), no irrigation during the growing cycle, and no use of insecticides or pesticides. The entire vineyard is planted on abandoned opencast mines, which have been restored from an environmental point of view, having received several national and European prizes for the restoration undergone. As a consequence of the location of the vineyard, the soils are poor and limy, with little depth. The vineyards are planted on the sites of ancient quarries, which have poor rocky soils. Thus, the vine's roots have to grow very deep to find water and nourishment. Viña Ijalba, which is also one of Rioja's leading Organic wineries, produces all of its wines under organic methods and processes. The wines of Bodegas Viña Ijalba, are the result of vineyards (viñedos) planted traditionally with the best bio-organic techniques. This fairly new bodega uses modern technology, and a totally original philosophy of wine making. The actual Bodega and cellar was constructed north of Logroño in 1991. Viña Ijalba owns 70 Hectares (175 acres) of vineyards which are in a number of parcels surrounding Logroño, in San Vicente de la Sonsierra, and Valle del Najerilla. These vineyards supply 100 % of the production of the bodega. The grapes planted have been matched to the soil type and micro-climate of each vineyard site. "Genoli" Viura: a Blanco made from 100% Viura. "Aloque" Rose: a young Rosado made from 50% Garnacha and 50% free run Tempranillo. "Livor" Tinto: a young Tinto made from 90% Tempranillo and 10% Mazuelo. "Solferino": a tinto made from 100% Tempranillo with fermentation using whole berries with traditional foot treading as practiced 100 years ago. 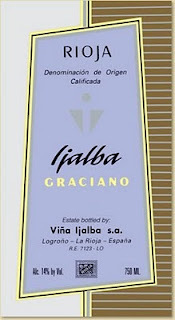 "Ijalba Graciano": a classic Tinto made from 100% Graciano. Apparently, in 1995, it was the first 100% varietal Graciano to be bottled on its own in the history of Rioja! "Múrice": a crianza en Barrica made from 90% Tempranillo, 5% Graciano and 5% Mazuelo aged for one year in new oak plus one year in the bottle. "Ijalba Reserva": a Reserva made from 90% Tempranillo and 10% Graciano aged for two years in new oak plus two years ageing in the bottle. "Ijalba Reserva Especial": a Reserva Especial made from 50% Graciano and 50% old vines Tempranillo aged for two years in new oak plus two years ageing in the bottle. Ijalba Graciano's vinification: fermentation of the crushed and pressed grapes occurred in stainless steel tanks at a constant temperature of 25°C. The wine was then stabilized at low temperature, and lightly filtered, and was aged in oak for aproximately 12 months before bottling. At first, this wine strikes you with its deep red-lilac-garnet color, somewhat unusual purple with timid brick reflects on the rim. On the nose, intense aromas of ripe figs and dark wild berries mingled with underbrush, slightly mushroomy, earthy notes (in a good intriguing way). The palate is fairly intense too and Terroir oriented. Rich and well balanced with great acidity and somewhat raw textured, the wine is fruity, earthy, medium to full-bodied, may be esoteric for some yet well crafted, soft and inviting with present yet nicely integrated chewy tannins. Definitely a food friendly wine, ready to drink now after a bit of aeration yet showing some good ageing potential. From the importer's point of view, it goes well with strong, heavy and spicy meals, red meat, venison (hare, boar, stag), but as well with fish like sea bream, tuna or cod (grilled or with a sauce) and all typed of risotto. FYI: we also have the 2005 vintage at the store, which is also a very good wine, somehow less austere yet, in my opinion, not fully ready to drink now and somehow less open than the 2004 for the moment due to some tannins that will need a bit more time to settle down. Despite this last comments, I also love the 2005 Viña Ijalba Graciano. By the way, the label of the 2005 vintage is quite different from the one of the 2004 vintage, it has been revamped. Over my 18 years career as wine buyer, I realized many times that there is nothing more attractive for my customers than an already prepared mixed case of white and red wines, especially when at discounted price. It usually easier for them because they don't have to make a choice and for me because I can, in that case (literally and physically), easily promote wines that normally do not trigger their primary interest or thoughts. So here is a selection of 12 of some of favorites wines (under $15) that you can get at the store at an already discounted price of $120 (before tax) instead of the regular price of $152 (before tax) at the store (www.HeightsChateau.com, a reminder for those of you who didn't realize yet that I'm the Wine Buyer and Store manager of Heights Chateau, Brooklyn, NY). New Year, new resolutions! Why not try some “out of the beaten path” expressive wines, made with rather unusual grape varietals from lesser known appellations. They will trigger your interest and open your palate to new tasting frontiers. Made from 100% Jacquere, an ancient local grape planted in the mountainous Alpine region of Savoie, this joyful, crisp and refreshing white is light, cleansing and loaded with minerals. Citrus peel, white blossom and white fruit with minerals almost add a sense of purity to this really appealing little Savoyard. Light-bodied with crisp, fruity sensations, it is a very fresh blend of 75% Colombard and 25% Ugni Blanc that are also the traditional grapes for Armagnac. Vivid in the palate, it bursts flavors of lemon, citrus peel and white peach enhanced by a great acidity leading into the food friendly and inviting finish, which makes it perfect for salads, grilled fish and white meat. Usually very floral, fragrant, quite viscous and mineral, Viognier is the perfect white for winter and mid-seasons. The “Grande Reserve” combines Viognier grapes selected from Northern Rhone and parts of Languedoc where it excels under ideal conditions resulting in a fruity, balanced and gently toasted wine. Pair it with roasted garlic chicken. Quite versatile and docile, Chenin Blanc produces some of the most vibrant, complex and delicate whites of the Loire valley. Bordering on off-dry, this aromatic Vouvray offers aromas of citrus and honeysuckle along with ripe apple and almonds. Residual sugars are balanced by racy acidity into a fresh, clean finish. Pair it with poultry or shellfish in rich creamy sauces. Made with the rather unknown Pardina grape, indigenous from the Spanish region Extramudra, this little, friendly and refreshing white is a surprising versatile value. 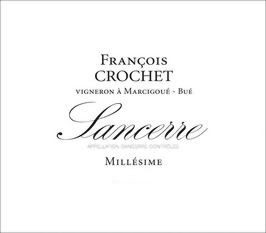 Soft and balanced with citrus, white peach flavors and good minerality, it also possesses great structure and length for the price. Enjoy is as an aperitif or with light salad, cold white meat and fish. Finding a 100% Cinsault is a rare thing. Usually used in a blend, Cinsault produces rather light, earthy, slightly rustic wines, but this unoaked and neither fined nor filtered example features chewy red fruits and ample notes of wet stone and earth. Made from 40 years old vines, it has fruity attack and a crisp, juicy finish with great acidity and integrated structure. Normally blended with Cabernet or Merlot like in Bordeaux, this Australian Petit Verdot is a fine example of what this grape offers on its own. Exhibiting aromas of violets, concentrated plum and blackberry with spicy oaky notes, it is a delightful wine, balanced and rich, yet with good acidity, aged for 12 months in American oak barrels. Pair it with quail, veal and smoke meats. This 100% Pinot Noir, from Bento Goncalves - Vale dos Vinhedos, is really well made, somewhat a cross between a Burgundy and a Languedoc Pinot Noir, but earthier and rustic yet juicy with lovely fruit texture and structure. Light to medium bodied, with great acidity, it is a great example of Pinot Noir from Brazil that shouldn't be overlooked. 3 Fincas is a juicy, earthy and dry blend of Carignan, Grenache, Merlot and Cabernet Sauvignon from the north-east of Spain. Spicy and ripe fruit aromas translate well onto the palate, complemented by notes of cedar and rosemary. Deeply structured, moderate acidity runs through the mid-palate, fading into a lingering finish. Enjoy with cured meats and cheeses. One of the leading wineries of the Pic St. Loup region, La Roque is a beautifully maintained 41 hectare estate, with a distinctive lilac-shuttered Château. A blend of Grenache, Syrah and Mourvèdre, the 2005 shows ripe flavors on the nose, with earthy and spicy notes. Terroir oriented, the palate is quite savory and warm on the palate with good density and structure. 100% Cabernet Franc from La Giareta estate in Veneto, this approachable red offers fruity cherry aromas with a touch of oak. Aged ten months in both oak and stainless steel, clean fruit flavors explode on the midpalate, supported by silky tannins and nice acidiy into a nice cherry finish. A versatile pairing wine, this works well with everything from chicken to lighter meats to creamy cheeses. Kanonkop’s Bordeaux-like style, blend and structure greatly appeal to most palates. Kadette presents very enjoyable fruit, a generous palate and a lovely balance. A blend of 45% Pinotage, South Africa’s pride, blended with Cabernet Sauvignon, Merlot and Cabernet Franc, this wine was matured in Bordeaux barrels for up to 16 months. 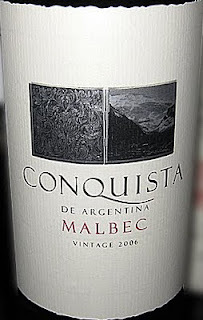 It offers rich, structured and juicy ripe red and dark berry flavors with hints of oak, spices and earth. I hope that you will like this little selection. I'm open to comments so feel free to let me know what you think about it. Surely an interesting derivative of the word “Iberia” from a marketing genius or, who knows, may be (or surely?) it was how Iberian spelled “Iberia” in an ancient dialect? However, “Aibyria” definitely means “Iberia” judging by the label which indicates it with an ancient Iberian map; and it is a great name for this little, friendly Portuguese wine. On the west end of Iberia, in Portugal, the Estremadura region, stretching along the Atlantic coast and the Tagus River (or Tejo in Portuguese), northwest above Lisbon (Lisboa), consists of south Leira, North Setúbal and most Lisboa districts; with obviously Lisbon has the province’s capital. Many centuries ago, even before the Romans, the wines of the southwestern Iberian Peninsula (Iberia) had already good reputation. However, things slowly changed and over the last 50 years, Estramadura was better known to produce inexpensive, bulk wines from the few cooperatives exploiting most of the vineyards of the area. The 90’s brought a renaissance to this beautiful region full of grain fields, orchards, and vineyards, along wide plains bordering the fertile and heavily wooded Tagus River valley. On the west end of Iberia, on north of Lisboa, the vineyards of Casa Santos Lima spread throughout gentle slopes of clay-limestone soils. With good sun exposition and needed protection from maritime winds from nearby hills, this region offers excellent conditions for the production of quality wines. Near the town of Torres Vedra, located roughly 40 kilometers north of Lisbon, Casa Santos Lima is a big winery covering about 280 ha, including 160 ha of vineyards with more than half of the vines planted since 1990. Their first bottling happened in 1996 and they are now producing more than 1 million bottles a year under a wide range of labels, including "Aibyria". Made in a more modern, extracted style, with long maceration and some ageing in new barrels made mostly of Portuguese oak, the wines have still kept a touch of their Portuguese roots and sense of Terroir. 2007 Aibyria Tinto is produced from the local grapes varieties: Tinta Roriz, Alicante Bouschet (or Bouchet), Castelao and Touriga Franca, through traditional fermentation methods, long maceration and 3-4 month of oak aging. The resulting wine is clean, earthy, and somewhat rustic in a good way. Beside its deep ruby-garnet color, the nose offers notes of ripe dark and red brambly fruit with earthy, spicy notes and slight hints of oak. The palate is quite fleshy with good richness and structure. The medium-long, persistent and earthy finish is very enjoyable. Pair it with Mediterranean food and grilled Lamb chops. Although Veneto, in northeastern part of Italy, is reputed for its bold, earthy reds like Valpolicella and Amarone made with the Corvina grape around Verona, the Venetian wine region also offers great whites with the sparkling Prosecco(s) and Trebbiano and Garganega which produces one of Italy's most popular white wines called Soave. However, many wineries, like Marcato, are also growing international grape varieties atop of the local grapes. 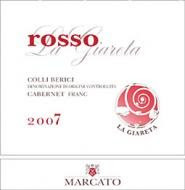 La Giareta rosso is a great example of the tremendous potential of wine diversity that Veneto has to offer despite its more acclaimed wines. 100% Cabernet Franc from La Giareta estate, this approachable and refreshing red offers fruity cherry aromas with a rounded slight touch of oak. After alcoholic fermentation in stainless steel tank, it was aged in oak for 10 months. Clean fruit flavors explode on the mid-palate, supported by silky tannins and bright acidity into a nice, inviting cherry finish. A versatile, crisp and friendly red wine, it will pair well with everything from chicken to lighter meats to creamy cheeses.